The Health and Social Care Secretary has announced an ambition to sequence 5 million genomes in the UK over the next 5 years. Where relevant, patients will be asked to give consent for their genome data to be securely analysed by approved researchers, who will develop new tests and treatments for cancer and rare diseases. From 2019, all seriously ill children will be offered whole genome sequencing as part of their care. Adults with certain rare diseases or hard-to-treat cancers will also be offered the same option from 2019. 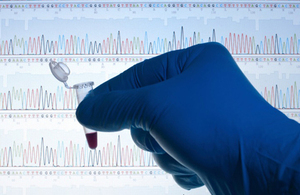 The NHS Genomic Medicine Service will expand on existing projects such as the 100,000 Genomes Project and see 1 million whole genomes being sequenced by the NHS and medical research project UK Biobank in 5 years. This will help support Matt Hancock’s wider ambition to sequence 5 million genomes in the UK by bringing together expertise from world-leading industry experts such as UK Research and Innovation, the NHS and other partners. At present, it can take years to diagnose a rare disease, but genomics has the potential to speed this up and reduce the number of invasive tests that patients currently have to undergo. The more genetic information there is, the earlier clinicians can predict, diagnose and treat the illness in a way that works best for each patient. "I’m proud to announce we are expanding our 100,000 Genomes Project so that one million whole genomes will now be sequenced by the NHS and the UK Biobank. "I’m incredibly excited about the potential for this type of technology to improve the diagnosis and treatment for patients to help people live longer, healthier lives – a vital part of our long-term plan for the NHS. "Today’s commitments form part of our bold aspiration to sequence 5 million genomes in the UK, using ground-breaking technology to do this within an unprecedented 5-year period."